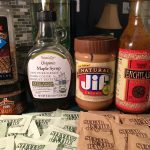 Sneaky Sugar In My Pantry | Kay Rice, M.Ed. 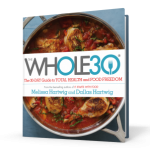 Step 1: Clean out, use up, or store in a separate cabinet the foods that you won’t be eating during the next 30 Days. This includes any foods containing sugar, grains, legumes (especially soy and peanut products), dairy products and artificial additives or preservatives. As part of the 90 Day Challenge, I’ve committed to completely eliminating sugar from my diet for at least the first 30 days. Going through my pantry and refrigerator was a great exercise for me. Even though I make pretty healthy choices, I had forgotten how much sugar is in EVERYTHING! I rarely cook or eat sweets, avoid processed and junk foods, and in general I eat pretty “clean” as I call it, avoiding artificial additives and preservatives, and I buy organic when I can. 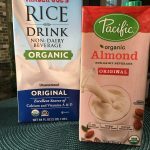 Still, as I was preparing my kitchen pantry and refrigerator for this challenge, I was surprised at what foods had to go, in particular things that didn’t make the cut because of added sugar. Did you know: The USDA subsidizes crops with our most over-consumed and unhealthy foods—mainly the ones I’ll be cutting out for the next 30 days. Among the top USDA subsidized crops: wheat, corn, soybeans, rice, peanuts, milk & corn fed beef. Funny how the healthier crops are not getting government subsidies. Makes me think, The government helped make (the) US fat. Yep, we won’t be consuming any of those either during the first 30 days of this program. Real food is always better than fake food! Artificial sweeteners are not good for you. These sweeteners are made of chemicals that are toxic to your body, and in spite of the fact they may have zero calories they can still affect your hormones and insulin response. Some of these artificial sweeteners have been linked to cancer and tumors as well as other problems. Stevia is the only natural zero calorie sweetener that is acceptable, and ait leaves an after taste that I don’t like. If you really need a sweetener you are better off to add a teaspoon of sugar, honey or other natural sugar to your food (after 30 days) and you will find a list of natural sweeteners at the end of this post. 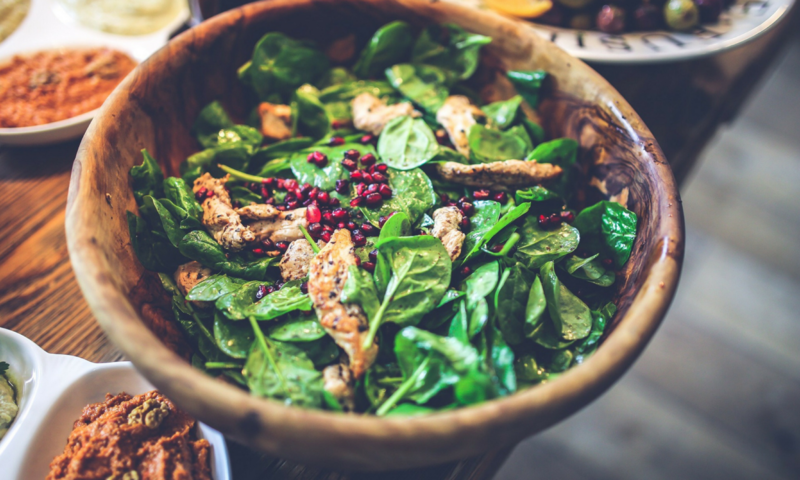 Gradually, as your eating habits improve and your blood sugar stabilizes you will find you can enjoy your foods without added sweeteners. You will begin to taste the full flavors and sweetness of your foods without the added sugars. Here are some of my healthy foods that didn’t make the cut. I shop at Trader Joe’s a lot, and I found a lot of my favorite items contained sugar so I won’t be eating them for a while. 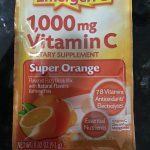 I still love Trader Joe’s, and it was where I went to stock up on a bunch of pantry and refrigerator items that I will be using during my challenge. So what didn’t make the cut? … and what did? Did not make the cut: McCormick Grill Mates, Pork Rub & Montreal Steak Seasoning, & Seasoned Salt. I think this surprised me the most! Spices from my spice cabinet! McCormick Grill Mates, Pork Rub and Montreal Steak Seasoning both contain sugar … so they got put on the back shelf. 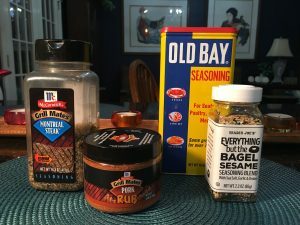 However, McCormick’s Old Bay Seasoning made the cut – so I’m keeping that one, and very happy about that since it is the number one favorite seafood seasoning around here in Coastal Virginia! Trader Joe’s Everything but the Bagel Sesame Seasoning Blend made the cut, too. I like to use that on grilled tuna and it may work for steak as well. I expected that the store brand of seasoning salt might contain MSG, which would disqualify it. It didn’t have MSG, but sugar is the second ingredient listed on the label. 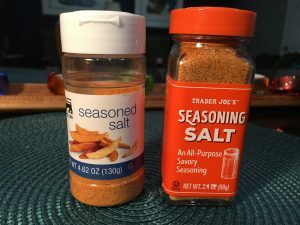 Trader Joe’s Seasoning Salt on the right made the cut; it contained nothing but the spices in the ingredients. 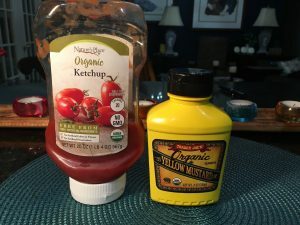 Organic Ketchup and Organic Mustard: both of them contained sugar, so they got moved to the bottom shelf. I haven’t found any ketchup without sugar. However, MOST yellow mustard does NOT contain sugar or any other additives, so you can go purchase Heinz, French’s, or most plain old store variety will do—just check the label. We will all be label reading guru’s by the time we are finished! 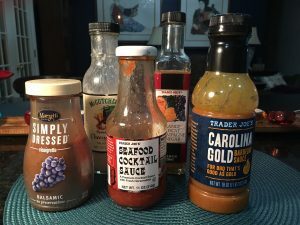 Trader Joe’s Organic Marinara Sauce didn’t make the cut because it contains soybean oil and Parmesan cheese—even if they are organic. You’ll find plenty of Marinara Sauces that also contain sugar, but this one did not. 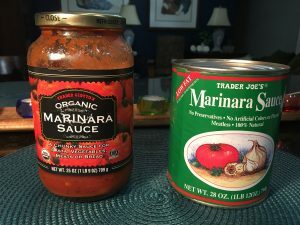 The one that did make the cut is on the right, just plain Trader Joe’s “Marinara Sauce” in the green can. None of my salad dressing, my Seafood Cocktail Sauce, Barbeque Sauces or even the Orange Muscat Champagne Vinegar made the cut. Most all of them contained sugar, and other ingredients that disqualified them were Soybean or Canola Oil, soy or milk by products, and other additives. The Simply Dressed Balsamic ALMOST made it! I was surprised to find that the Almond Drink, even the original unflavored version, contained sugar. The rice drink, obviously is derived from a grain and it had other ingredients that may have disqualified it as well. Hmmmm … these may just have been a waste of money and calories that could have been better spent on something that was more nutritious and tastes better! 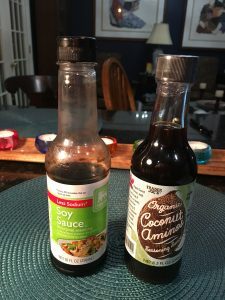 The Lower Sodium Soy Sauce – well no soy, and soy sauce contains gluten, but there is an alternative. See Trader Joe’s Organic Coconut Aminos on the right? That one made the cut and is now my new condiment. My protein powders and meal replacement shakes didn’t make the cut either. Many protein & meal replacement shakes contain off-plan ingredients like whey, casein, soy, rice bran, pea protein and added sweeteners. Become a Label Reading Guru and a Sugar Sleuth! What is the moral here? Read the labels! Read all of the labels and don’t take anything for granted. I didn’t have a bunch of sweets, cereals, brownie mixes or any cookies or cakes in my kitchen. Yet, I still found plenty of Sneaky Sugars and other additives in the “healthy” foods stocked in my pantry. At least most of these items listed “sugar” right there in it’s natural state, but in many processed foods and nutrition bars hide sugars by calling them by other names. Anything ending in “ose”: Dextrose, Fructose, Glucose, Galactose, Lactose, Maltose, Ribose, Sucrose. They come from different places, but it’s all still sugar. Words ending in “ride”: Disacharide, Monosaccharide, Polysaccacharide – which reminds me, when you are reading a label and there are long names of things on them that you can’t pronounce and haven’t ever heard of, then generally it is something you don’t need. Simple and nutritious foods have a few simple ingredients, most of which you should recognize as food. Artificial Sweeteners: Artificial sweeteners were just in the news again this past week. Although it’s taken a while to “prove” how bad they really are for you, just remember my mantra: “Real Food is always Better”. A recent study has shown that artificial sweeteners tend to CAUSE long term weight gain. When I worked in a restaurant I noticed that it was mainly over-weight customers that ordered diet sodas. Interesting, huh? And artificial sweeteners have long been known to get an insulin response from the body, just like real sugar. So? You are better off just having that teaspoonful of sugar instead of a sugar substitute. Okay the list of artificial sweeteners: Aspartame, Equal, Nutra-Sweet, Saccharin, Splenda, Stevia, Sucralose, Sweetleav, Sweet-n-Low, Truvia. Sugar Alcohols: Most of them end in “itol, but there are a couple of exceptions. A few years back I tried a nutrition bar that was sweetened with one of these sugar alcohols, and quite frankly every time I ate one of those bars I got all gassy. I was told it was an intolerance to the sugar alcohol used as a sweetener for that bar. Ugh! Okay, here’s a list: Arabitol, Dulcitol, Erythritol, Iditol, Lactitol, Maltitol, Mannitol, Polyglycitol, Ribitol, Sorbitol, Threitol, Xylitol. And some of the more tricky names are: Glycol, Glycerin or Glycerol, HSH and Isomalt. Finally, here are some natural sugars. 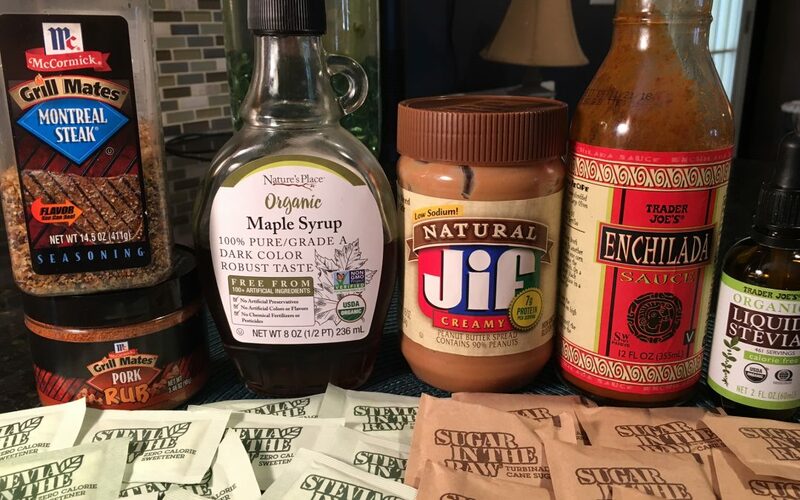 When you re-introduce SOME sugar in your diet, I’d chose some of these first over the ones that have all of those complicated and scientific sounding names: Agave Nectar, Coconut Nectar, Coconut Sugar, Date Sugar, Cane Juice, Fruit Juice, Honey, Maple Syrup, Molasses, Monk Fruit Extract, Rice Malt, Sorghum, and Treacle.